Heads up! There'll be a super cool party at tomorrow showcasing local talents and aspiring singers to take the stage at one of Singapore's hottest music scene - Mansion @ Esplanade! That's my awesome friend Mint on the top left! She'll be hosting this awesome event! Day 1 (29/11): Performance Night where local artistes, Tay Kewei, Kevin Lester and Jonathan Leong will be performing on the 29th. They have also invited local band, LGF, that performs regularly at Switch, Shuffle and ROCKU weekly. 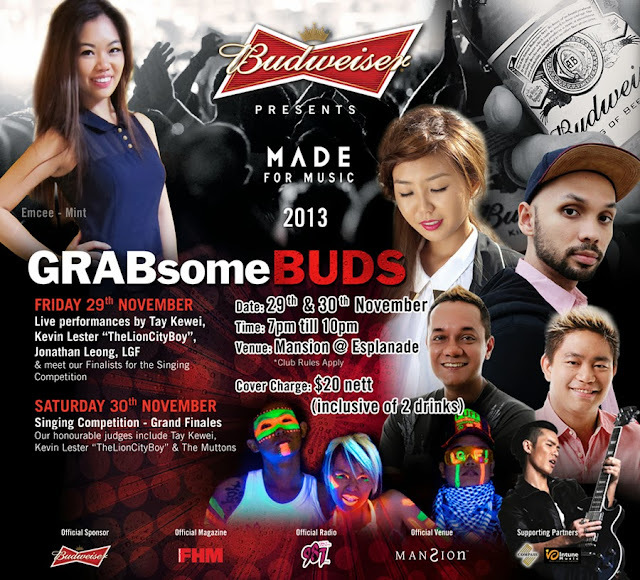 Day 2 (30/11): Final Showdown of Budweiser 'MADE FOR MUSIC' 2013 Singing Competition. EIGHT finalists, who have submitted their works via the Budweiser Singapore Facebook Page, will be chosen to battle it out for the winning title! The judging panel includes Tay Kewei, Kevin Lester, The Muttons & a representative from S2S recording firm. And if you havn't already known, Budweiser MADE for Music is celebrated in more than 85 countries and it kicked off with Jay Z and Rihanna this year in America. With the purpose of showcasing local talents, this festival aims to provide a platform for them and what better place than Esplanade? If you are too shy to be in this contest this time, you can head there to chill (and recce) this time and soak up the spirit, and get an idea of what to prepare for next year's! :) Afterall its a Friday night! Awesome place to chill with some Budweiser! Let's end November with a bang! Seeya there!